Unexpected Friendships in The Dominican Republic. Porque viajas sola? Why do you travel alone? Some questions don’t change even on the other side of the globe. I was sitting in a cave under a waterfall, beer in hand, in the Dominican Republic – a Caribbean nation that hadn’t been on my radar until I found a cheap flight and two unplanned weeks in New York. I was sitting in a cave under a waterfall, beer in hand, with Juanin, a newfound friend who had quit his job in a golf resort to become an independent guide – leading curious travellers to secret waterfalls and pristine villages near the north coast, one of which he grew up in. I wanted to tell Juanin that I travel alone because if I didn’t, I probably wouldn’t be sitting with him in a cave under a waterfall, beer in hand, chatting like long lost friends. 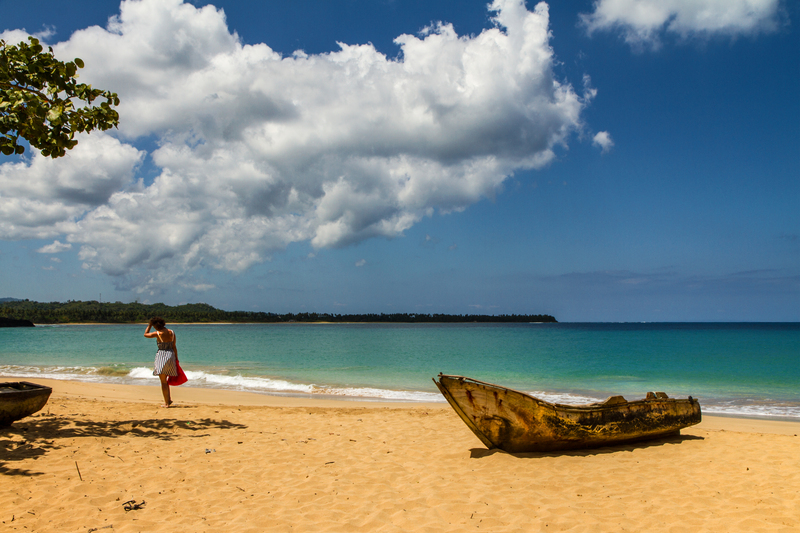 The dreamy blues of the Dominican Republic. Una vida: You have one life. When the folks at my sweet abode in Tubagua introduced me to a local guide, I told him I wanted to do what the locals did for fun. So we rode his motorbike on bumpy roads, through vast meadows and sleepy villages, stopped at a small shop to pick up beer, and parked the bike in the backyard of a family that earns its livelihood making yoghurt and cheese – politely declining their invite to stay for lunch. We hiked to the end of the village, to find pristine waterfalls and three natural swimming pools all to ourselves. By the water, we sat for hours, drinking beer, warming up after jumping several times into the pools from different cliffs – talking about everything from our personal choices to stay independent and do work we truly love, to the Dominican Republic’s complex relationship with Haiti, to its secret nightlife where young women seem to enjoy making a quick buck from keeping older expats company. Juanin suggested heading back into the water and waded in with our beers, into a (secret) cave under the waterfall! That’s when the solo travel conversation happened, and we clinked our beers to one conclusion: Una vida – One life! Choose how you want to live it, and don’t judge others for their choices. Cheering to life with Juanin. I clearly remember that sunny October afternoon. I was walking to a surf beach in the southern region of Barahona, when a young boy started following me. I was wary, held my bag close and hurried my pace. He continued closely behind, so finally I broke the tense air (in my head anyway) and asked him which way the beach was. He pointed to his mouth and ear, indicating he couldn’t speak or hear – and continued following me. I wasn’t sure what was going on, so I decided to turn back and go to the beach another time. But seeing me turn, he pointed to the left curve ahead and insisted I go on. I asked him to sit next to me and together we watched the waves crash against the shore. The crashing sounds wouldn’t let me think, but if they did, I’d ask the universe why it was so unkind as to not to let him hear its beauty. In the remote Valle Nuevo National Park in the heart of the Dominican Republic, I hiked down the mountain to its only village – El Castillo, home to 70 families. Locals here live off potato farming and jam making, and lead isolated but laid back lives among gorgeous mountain vistas – so much that no one seemed to notice (or be bothered by) my pointless wandering around. Except one young lady, who responded to my smile with an invitation to join her and her daughters as they picked blackberries off the hillside. She invited me into her humble one-room house, where the pans were boiling with blackberry jam! Much of our conversation was lost in translation, but I did gather that she sustained her family with a small jam-making business – which she bottled and sent off to the capital city, to be enjoyed by people who’s lives she didn’t have a clue about. With the kids looking hungry for lunch, I thanked her for her kindness and stepped out, but she came chasing behind with a bottle of hot blackberry jam – fresh out of the pots – pouring out Spanish instructions to let it cool before eating. It’s never about how much money you have, it’s always about how big your heart is. Mine felt overwhelmed in that moment. I travel because Google can’t capture the feeling of being welcomed into someone else’s world. I made the long journey to the southwest region of the Dominican Republic, with dreams of exploring curious lakes, pristine beaches and a part of the country far off the tourist circuit. Only to realize that poor public transport connectivity and little tourist infrastructure meant sky high costs. I related my woes to Nino, a part-time driver who came to fetch me to my home by the sea. Two days later, on his day off, he showed up in the morning with his motorbike – ready to drive me to Laguna de Ovideo, a gorgeous saltwater lake and the home of migratory flamingoes, 50 km away – at a very nominal cost. It was the first time he’d be venturing that far on his bike. Flying through the wind, we rode along the dreamy blue coast, winding hills and meadows covered with windmills, to reach Oviedo. On a boat in the lake, we saw hundreds of flamingoes standing in the water, flying, catching fish! We heard that when the seasons change, they’ll make the long journey to Florida – no maps needed. I want to be a bird in my next life, so I need no compass and no planes. But for this life, serendipitous bike rides will suffice. Chilling with flamingoes at Laguna de Oviedo. Have you made unexpected friends on your recent travels? Share your stories. I’ll be sharing recommendations for unique eco lodges across the Caribbean soon. Subscribe to my monthly newsletter (or to individual posts on the top of the right column) so you don’t miss it. PS: Big thank you to everyone who answered my first ever reader survey! The winners of the lucky draw are M.A.Razzaq Siddiqui and iamblackwildflower. “Una vida – One life! Choose how you want to live it, and don’t judge others for their choices”……You nailed it. I met so many people from different spheres of society on my solo backpacking across 8 states in 4 days in last week. It could not have been possible if I could not go solo. I met event organizers, orthopedic surgeons, ace photographer, a Russian entrepreneur, freelancer, an Army Colonel, a banker, a budding engineer who is making a solar powered vehicle with artificial intelligence and scores of Aam Admi who are too common to categorize but everyone left their little signature in my heart in just a span off four odd days. Wow Amitava, that’s a lot of experiences for just 4 days! Thanks for sharing your story. I think the people we meet along the way kind of defines the essence of solo (or shall I say, not exactly solo) travel. Loved reading the post and i can relate the friendship part to myself. I am not good at making friends but when i am on my own in my travel,i always bump into some strangers to become good friends.I have made some really good friends during my travels. I so understand that Ajaya, I’m exactly the same way. Even when I’m by myself, I would rarely make an effort to strike a conversation, but always end up with serendipitous encounters and friends. May our tribe grow! Glad you found my blog, Roopali! I was in that place not so long ago, where I wanted to travel more but just didn’t know how. Blogging changed that 🙂 Hope our paths cross sometime. Thanks Chaitali, I’m so glad you are seeing these places and meeting these people through me 🙂 But I sure hope you’ll find your own special places and people in the coming months / years. Thanks for reading as always! Loved this story! Serendipity like this…it’s the best part of being on the road! Thanks you guys! And I agree, travel wouldn’t be half as impactful without the people we meet. You articles are always a pain-relief to my cubicle job. This was indeed a long read But I couldn’t move anywhere without completing this one. Shivya every time I read your post , it sends me to a state where I feel that this materialistic world is not the prime importance of my life. I just love your post and your travelling stories and after reading this post i am feeling wow because i am so much curious to know about the beautiful places around the world. I am really fond of travelling and i really want to travel the world but yeah it may not be possible for me. I love travelling the places through travel blogs like yours so thanks for sharing for awesome experience with us. Shivya, your travels often leave me in awe of you and the scenic locales you click photos of. This time, the jam lady with the hungry kids left me with a lump in my throat. Suddenly I had to stop and think… visualize… about a woman cooking jam with her daughters, inviting a stranger and not being able to communicate with her but saying so much. I am speechless at the prospect of what stories she’d tell you if you had a language in common! I wish you wind beneath your wings, Shivya. I have not been yet to the Caribbean, but visited Peru and Ecuador last year and I must say that the Latin Americans are one of the most friendliest people in the world. Hi, there! Where in India would you recommend for a 9-day trip with a 16-month-old baby, in the last part of March? A place that will not kill us with heat, where we can get basic baby food, which is not too remote, and which has just enough tourist attractions to keep us engaged, but not too much for us to get bored? TIA. Beautiful experiences and friendships! These are the underrated and unheard marvels of travel that nobody talks of.. I am amazed when travelers avoid interacting with locals and stick to a to-see list in new lands, because for me that is pretty much carrying your home and old ways wth yourself and never really engaging with the destination at all.. Thanks for your visit to my country. You showed many beautiful things but there are a lot more! una vida! This is a great post with some wonderful photos. Our beautiful country has so much to offer and the people are extremely warm and friendly. Previous Post7 Epic (yet affordable) Airbnbs to Stay in Sri Lanka. Next PostAn Experiential Guide to New York City.